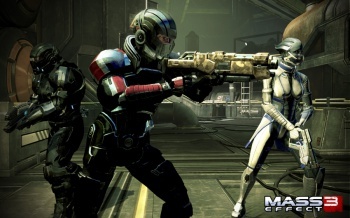 EA blames Valve for Mass Effect 3 not appearing on Steam. It seems that the spat between EA and Valve over Steam is still going strong, as Mass Effect 3 will not appear on the service when the game launches on March 6th. Writing on the BioWare forums, community co-ordinator Chris Priestly said that while ME3 would be available on certain third party download platforms, Steam would not be one of them. The blame is once again being laid at Valve's door, with Priestly saying that Steam's restrictive policies regarding downloadable content and interaction with customers. He didn't say that the game would never be available on Steam, but implied that Valve would have to change its policy before that could happen. "During initial release Mass Effect 3 will be available on Origin and a number of other 3rd party digital retailers, but not on Steam at this time," he wrote. "Steam has adopted a set of restrictive terms of service which limit how developers interact with customers to deliver patches and other downloadable content. We are intent on providing Mass Effect to players with the best possible experience no matter where they purchase or play their game, and are happy to partner with any download service that does not restrict our ability to connect directly with our consumers." Priestly also made it clear that Origin would be necessary to play the game on the PC, regardless of where the copy of the game had been bought. "Mass Effect 3 will require a one time, single authorization for the single player game. There is no limit to the number of installs. Playing Mass Effect 3 multiplayer will require a constant connection ... Origin is required for the PC versions of Mass Effect 3, both physical and digital."